These 39 were consolidated and an on-line survey gave rise to the top 26. From these a group of doctors and patients decided on the top 10 shared priorities. The final workshop to decide on the top 10 was observed by the Department of Health and the Health Protection Agency as witnesses to a rigorous, open process. The James Lind Alliance (JLA) is funded by the National Institute for Health Research and provides an infrastructure for patients and clinicians to work together to identify and confront the uncertainties about the effects of treatments. LDA provided the funding for the JLA Lyme Disease Priority Setting Partnership (PSP). 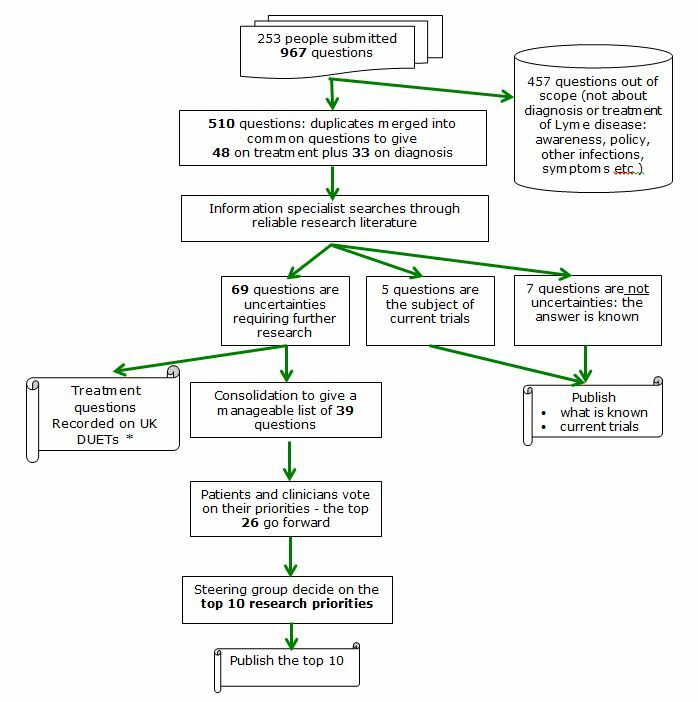 The process is shown below, together with the number of questions at each stage. * The UK Database of Uncertainties about the effects of Treatments (UK DUETs) now archived. The full table of uncertainties can be found on the National Institute of Health Research JLA website.